There’s nothing quite like the refreshing softness of a luminous green lawn – but is it really achievable with a busy lifestyle? it’s certainly true to say that lush green grass doesn’t happen without effort and consideration, but you CAN achieve it without needing to make it a full-time job. And if you still want the lawn but have zero time? Jim’s Mowing services are the best way to get the lawn of your dreams. 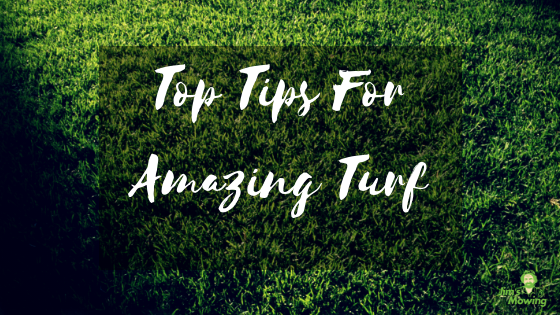 Let’s discuss our top five tips for lawns you’ll be proud to show off this summer. Appropriate moisture levels will not only ensure your grass is well hydrated and will cope under can rule out the biggest reason your lawn doesn’t look great. Just before watering, a dry spade or trowel inserted into the soil below the growth will give you a good idea of how much moisture your lawn requires. If the spade can be pulled out and only shows moisture on the top two inches of soil, double your watering time so it reaches down to 4 or more inches. This will ensure the moisture reaches the roots effectively. A bone-dry, rock hard soil bed will never produce frothy green growth. Aeration improves water retention and encourages the healthy underground community every great-looking lawn needs. Invest in a lawn roller or, kill two birds with one stone by donning a pair of handy spiked gardening boots when you’re mowing the knoll. Familiarise with fertiliser and compost. Compost build up organic matter in your turf – which is vital for healthy progress. You can buy compost or of course, make your own. Fertiliser should be actioned with caution when it comes to lawn care. Some synthetic fertilisers will destroy good soil cultures, while organic fertilisers are safer to use. You should always fertilise prior to a rainy day if possible. After rain, you’ll find weeds easier to remove and less likely to grow back. The softer soil makes this process much easier, as does investing in a weed fork, which can be a satisfying habit to get into! A couple of minutes a day spent uprooting dandelion weeds or other varieties is enough for most medium sized gardens to keep on top of annoying pop-ups. Did you know less than 3% of the insects in your garden will damage your lawn? For the most part, your garden benefits greatly from the presence of creepy crawlies. If your soil is healthy and thriving, pest control is very rarely necessary. Instead of declaring war on pests, always consider the benefits of improving your soil health first! Jim’s Mowing experts are proud to offer a range of professional garden and yard maintenance services designed to improve the look and appeal of your home and gardens. Our detail-oriented team are fully equipped with everything required to achieve a well-presented tidy home, with lawn mowing, gutter cleaning, tree pruning, rubbish removal and more. For further information or to book one of our team members please call our team on 131 546 today.